Many TMG users want to use the program to create a book of great size or even just a small booklet that can be distributed among their family at a reunion or as gifts for Christmas. While TMG was not actually designed to create books or booklets, user can generate and combine various reports so that books and booklets can be created that are very nice. This is especially so if the reports are generated for opening in a word processor. A number of users sending the reports to MicroSoft Word have selected to use the TMG option to create a table of contents for the report. Then after they open it in MS/Word, they seem to have problems creating the Table of Contents. Part of the problem is that they do not realize there are a number of different ways within MS/Word to create tables of contents. The usual way that most users create tables of contents is using styles based on fonts, font sizes, and other settings as that is what most are familiar with. . 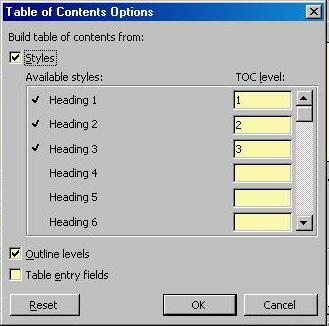 In MS/Word, there are built-in styles, custom styles, outline level formatting, and table entry fields. You may use any or any combination of these as suits your needs at the time, TMG uses the table entry fields method which requires the user to select the correct options in the word processor as the default setting are for the style and outline methods. Place the cursor at the point where the table of contents should be created. 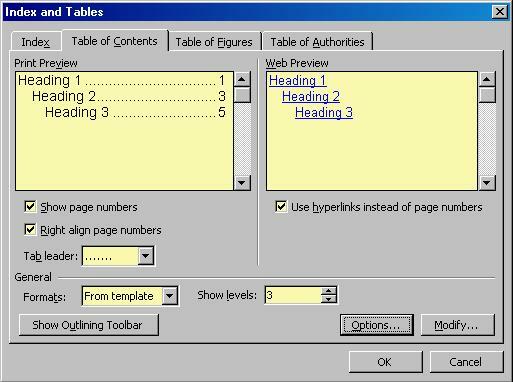 Select Insert=>Reference=>Index and Tables... from the Main Menu of MS/Word. This will cause the following Index and Tables window to display in which you would click on the Table of Contents tab as below. Click on the [Options] button to display the Table of Contents Options window. as below. Select the Table entry fields option. The current design of TMG reports is that the MS/Word built-in Styles option here are not used. If you have modified the report within MS/Word to use any of the built-in or custom styles, you may wish to leave that option selected. If these modifications include the use of styles and you do not wish those in the table of contents then you will want to de-select the Styles option. Click on the [OK] button to choose these selection. Make any format changes desired in the Index and Tables Table of Contents tab window and click on the [OK] button to close that window, apply the selections and create the table of contents. As noted, the above procedures work for MS/Word 2003. The process should work for most versions of MS/Word although the steps may be changed in a minor way. Note that re-creating the table of contents does not overwrite or replace any prior table of content unless you highlight the prior table. This procedure applies only to TMG reports opened in MS/Word. It or a variation of it may also apply to TMG reports opened in other other word processors.